American General Financial Services needed access between the existing campus and the new downtown campus building. They also wanted the skywalk to be completely enclosed, climate controlled and designed to match the existing building facade. The project’s contractor, Industrial Contractors, Inc., had worked with Contech in the past and chose them to provide three Continental® Gateway® style truss bridges - measuring 7-ft. x 122-ft., 7-ft. x 122-ft. and 10-ft. x 28-ft. - to meet the project guidelines. The bridges were designed to include exterior glass with aluminum glazing and a finished roof to match the existing buildings. The design allowed for the interior space of the skywalk to be air conditioned in the summer and heated in the winter. The truss structures were installed over a two-day period, followed by the roofing and glazing systems. 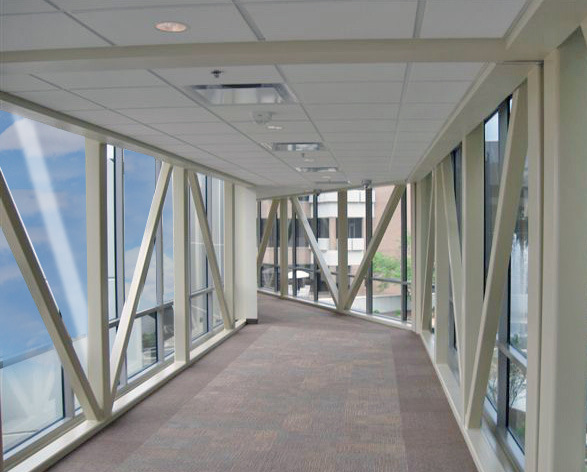 The skywalk met all of the owner’s requirements and provided pedestrians with a climate controlled crossing between their office building and parking garage. In addition, the structures met the owner’s budgetary and scheduling requirements. Width: 7 -ft. , 7 -ft. , 10 -ft.